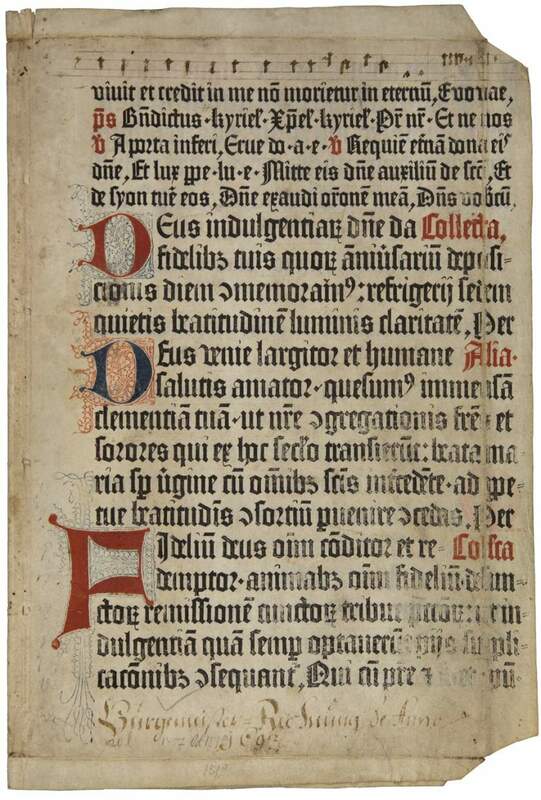 Incunable leaves on vellum – Rubrics printed in red, initials printed in red and blue alternatively with printed decoration in the opposite colour. From the first psalter by Fust and Schöffer, second issue. – Two connected leaves, fol. 148 and 151 (= Q5 and 8). The Mainz Psalter of 1457 was the first dated printed book. Moreover it grants for the first time in printing history the names of its manufacturers, which demonstrates a new self-regard stirring in the wake of book printing. The Mainz Psalter is one of the most famous monuments of early printing, next to the Gutenberg Bible of two or three years before. It is the first book printed in multiple (three) colours. Contrary to most of the early incunables, which just leave space for initials and rubrication by hand, the printer attempts to include these elements within the printing process. Tricolour printing, however, proved to be too laborious and time-consuming and the method was thus abandoned soon afterwards. The book was printed by Peter Schöffer, Gutenberg's most talented collaborator. After the bankruptcy of Gutenberg's firm, Schöffer began a partnership with Fust, whose financial support paved the way for his career as one of the best and most successful printers of the incunabular age. The present double leaf from the large and splendid Psalter edition had been reused to cover the binding of an account book of 1693.